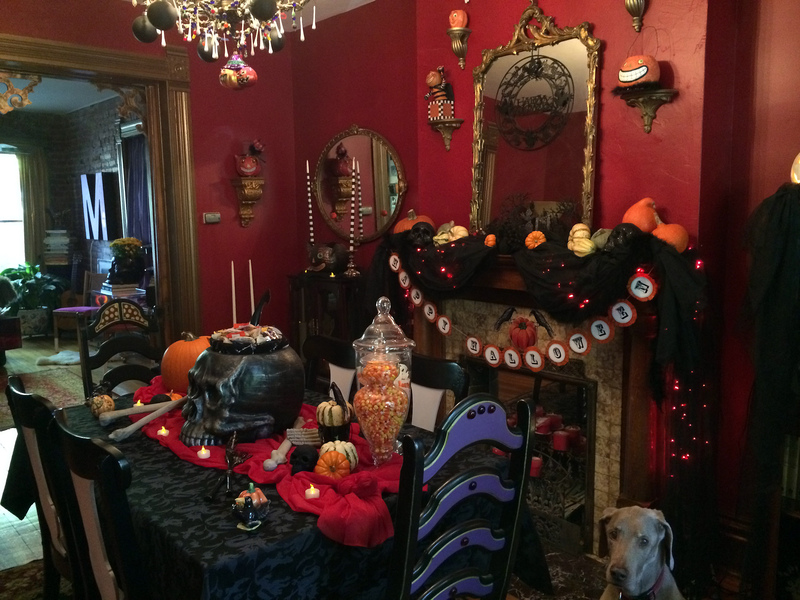 Victorian Gothic HALLOWEEN!!!!!! A Home Tour: Today, the Front Room. Decorating on the Cheap DIYs, Tips & Tricks. Did I happen to mention I LOVE HALLOWEEN! 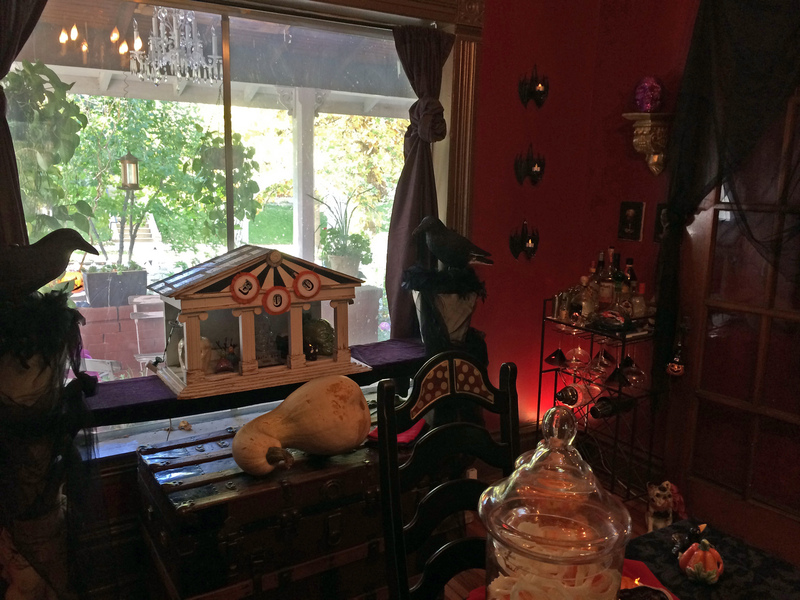 I live in an old “Denver Square” Victorian home, so our decorating tends to be a sort of “Victorian Goth” style. 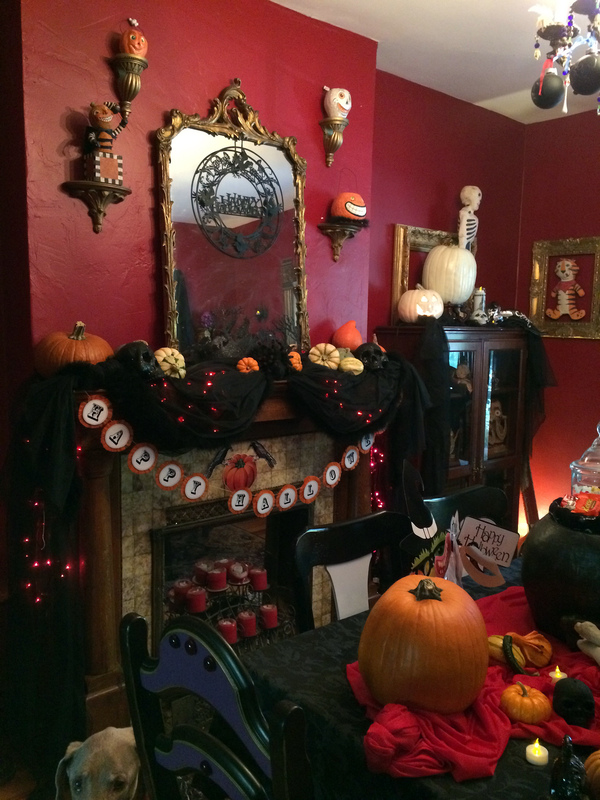 Today we’ll tour the Front Room, where most of the Halloween Magic happens. Everything you see is either DIY, found, reused, or picked up cheap at the thrift store. This year the only things I spent actual cash money on are a couple of pumpkins, the little gourds, and of course the candy. The biggest splurge was a giant 20 pound white heirloom gourd. It was just too cool to pass up, and I’ll use it for Thanksgiving too. TIP! 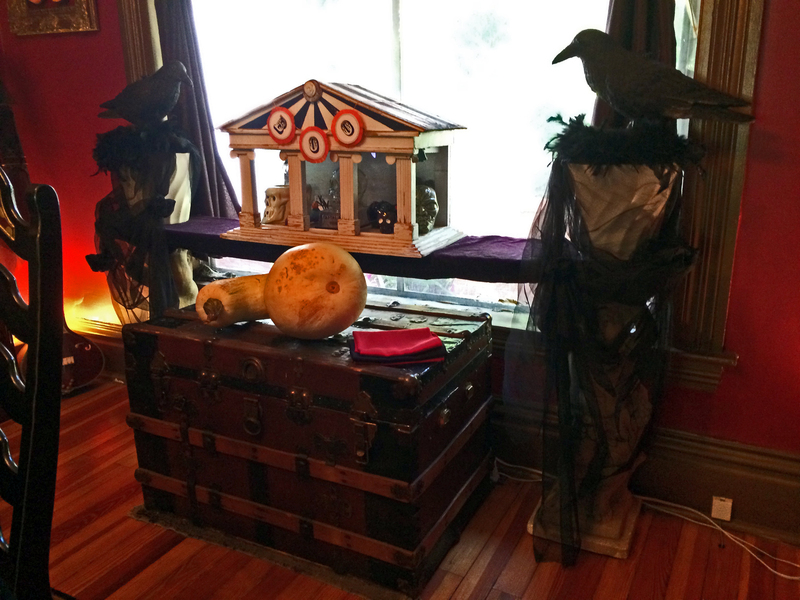 The trick to keeping your Halloween decor fresh is to use your old stuff in new ways. Move it to another room, create new combinations, or paint it. Let’s start with the table shall we? (See picture above). Most everything on the table I’ve had for years. The candy jars and beakers I’ve been collecting from the thrift store whenever I find them, usually about $3-5 each. Even the candy corn is “reused. (I put it in the freezer after last year’s celebration ;-). Those plastic bones were leftover from a cheap “Bag of Bones” that we used pieces from for our voodoo costumes last year. TIP! 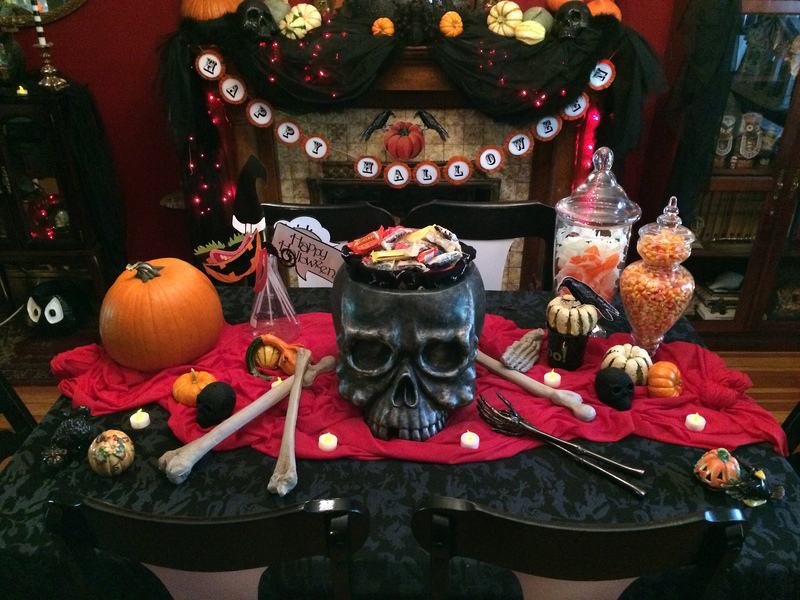 The awesome big skull, the black tablecloth, and the skeleton salad tongs were purchased half-off at Target years ago. The day after Halloween they mark everything half-off. That’s the time to stock up! For the cabinet to the right of the fireplace I created a new vignette by putting all the white decorations together there. These are all things we’ve been using for Halloween for years except the mask. It’s been hanging in our closet for a couple years and I decided to add it into the mix for Halloween this year. (we have a thing for masks 😉 And there’s more of that sheer black fabric. You’ll notice it all over the room, used as a “unifying” factor for the decor. Knotting it adds interest. For the cabinet to the left of the fireplace, we had a little fun. 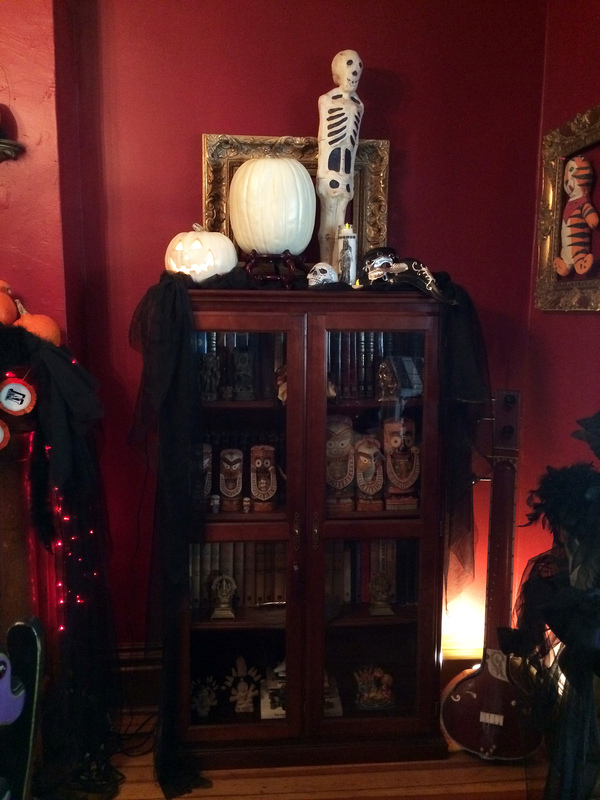 I emptied the cabinet and created a little scene in there with a few “devilish” items we had elsewhere in previous years, keeping it fresh by moving things around from last year. The top of the cabinet is the same as last year (See a DIY on those candlesticks HERE) There is nothing new here, just the old stuff “re-purposed”. 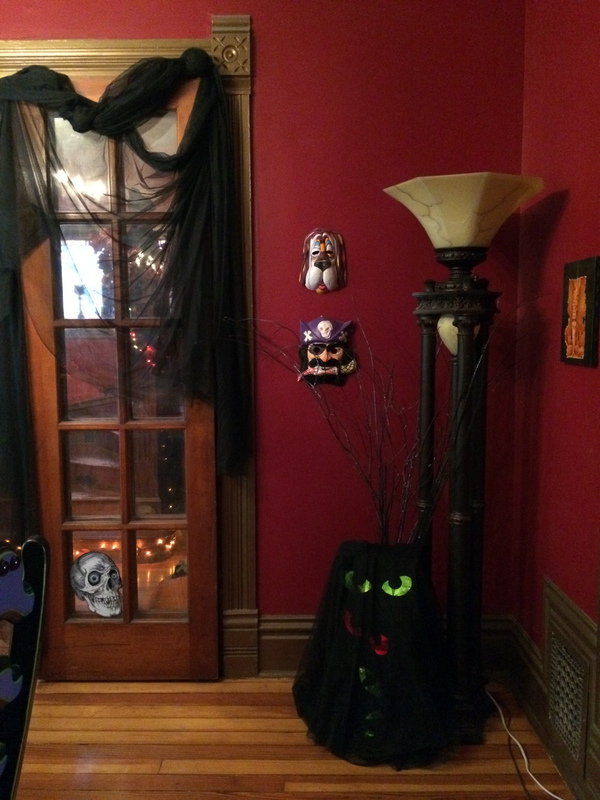 Remember those ghoulish blinking eyes that were outside last year? Here they are, moved inside. This is just 3 of the shoe box eyes stacked on top of each other and covered with the sheer black fabric. 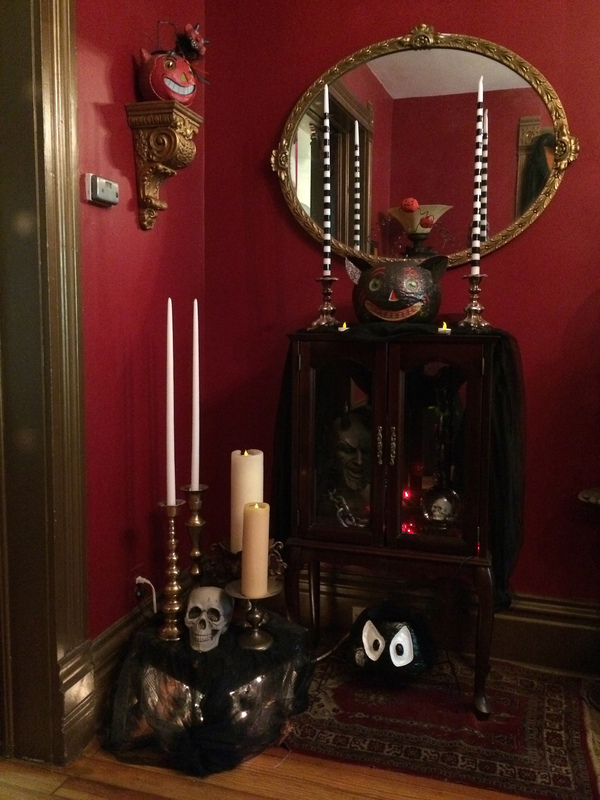 The black glitter sticks that were outside last year have been placed behind the eyes this year, and I removed the regular art on the wall and replaced it with a couple vintage dime store masks I’ve also had for years. The Window. I love how this looks. These are my old crow decoys that I usually put outside. I brought them all inside this year and put two of them in the big pots. I added some more of the sheer black fabric and some black feather boas to create a “nest’ for them and cover their bases. There’s that giant gourd I mentioned earlier. 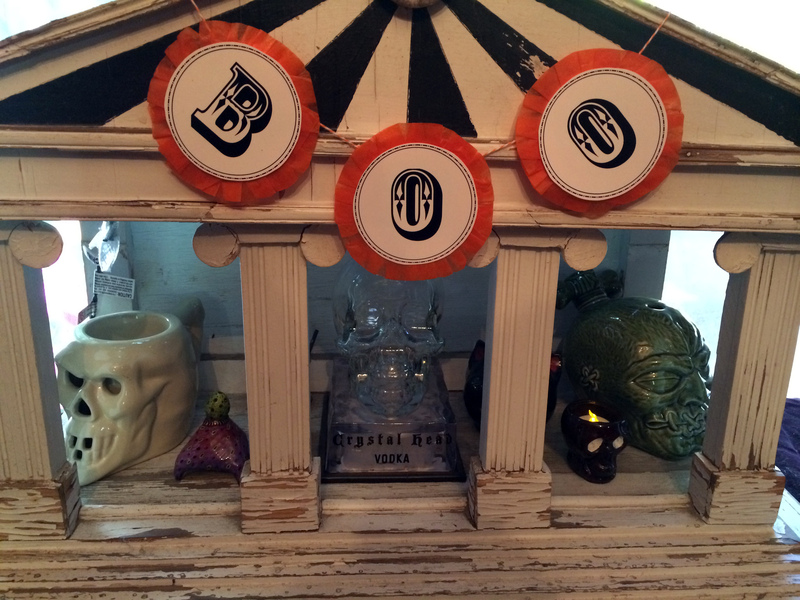 The skull collection inside the black and white display is actually there year-round. There’s a reason why our friends call us “Gomez and Morticia”! Here are a couple more pictures for you to enjoy. I hope you’ve been inspired! Next time: The Entry and Staircase. 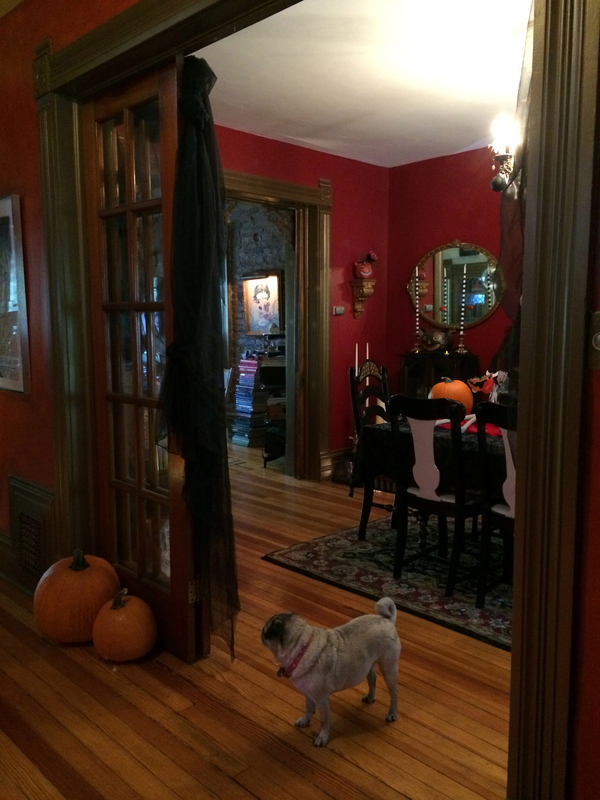 That’s our pug Emma in the first picture, and our “guest” Miss Cleo the Weimeraner in the second. (we dog-sit through Dogvacay) What hams! 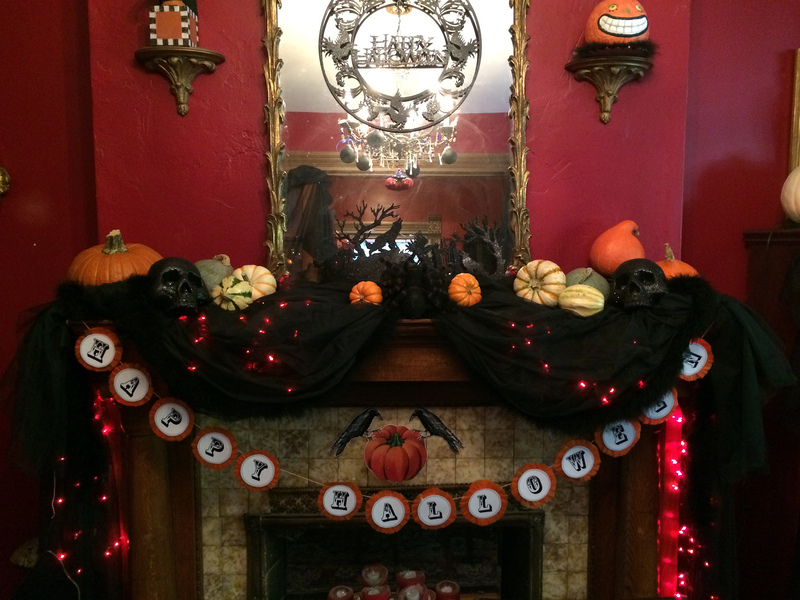 This entry was posted in DIY, Halloween, Holiday Decorating, Holidays, home and tagged decor, decorating, DIY, DIY Halloween decor, DIY Halloween Decorating, gothic halloween, gothic Halloween decor, Halloween, Halloween Decor, unusual halloween decorating, victorian halloween, victorian halloween decorating. Bookmark the permalink.